Everything's bigger in Texas, right? 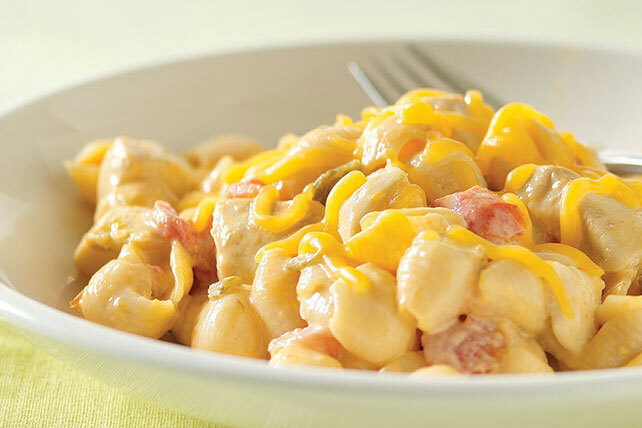 So it is with our Cheesy Texan Skillet, which gets its cheesiness from a mac and cheese dinner and shredded cheddar. Drain tomatoes, reserving liquid. Add enough water to reserved liquid to measure 1-3/4 cups. Cook chicken in large skillet sprayed with cooking spray on medium-high heat 5 min. or until done, stirring occasionally. Add Shell Macaroni, tomatoes and tomato liquid; stir. Bring to boil; cover. Simmer on medium-low heat 9 to 10 min. or until macaroni is tender. Remove from heat. Stir in Cheese Sauce and sour cream until well blended. Top with shredded cheese; let stand, covered, 1 to 2 min. or until melted. Prepare using KRAFT 2% Milk Shredded Sharp Cheddar Cheese. Prepare as directed, substituting 1 cup TACO BELL® Thick & Chunky Salsa and 1-1/2 cups water for the chunky tomatoes and tomato liquid mixture, and reducing the sour cream to 1/4 cup.